Well, I hope you all had a super fantastic Christmas! Mine was absolutely wonderful and a bit on the overwhelming side, to be honest with you! WOW! I am just so blessed! Today is another Skipping Stones Design Sketch Tuesday and I am not lying when I tell you that I am quite pleased to be moving on from Christmas cards! LOL! 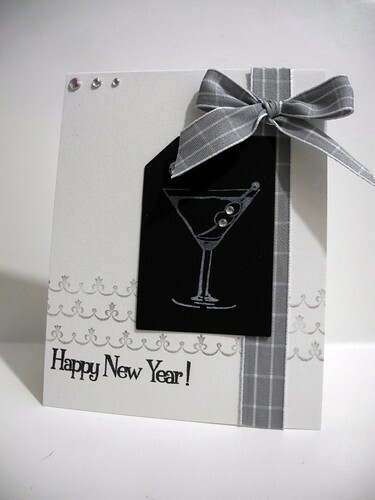 I used the Chic Martini set to create this super fun New Year's card! The chalkboard tag is from Canvas Corp. and the ribbon is May Arts fabulousness! I stamped the silver border in the background using the Frills set! I love these stamps!!! Now..head on over to Skipping Stones, check out the sketch and the inspiration from the rest of the team along with our amazing guest designers and join in the fun!!! You could win free Skipping Stones Stamps! 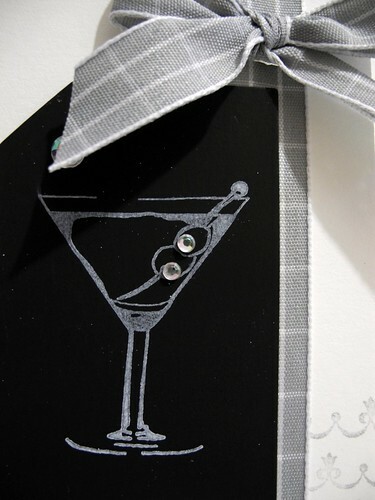 I always think silver when I think of new year`s - love this, with the awesome ribbon & gems, and that`s a fab martini image. I love how you added gems to the olives! Love that Frills border!!! Super cute card! What an elegant card, I love it! Love the monochromatic thing going on here! You're not the only one glad to be moving on from Christmas. I love it, but am glad it's only once a year! Love this card! Happy New Year! I gave up on my silver ink pad. What a beautiful card and super great take on the sketch. What a fun card! Very festive!! Hey, lil' Jingle-girl! I MISSED you! 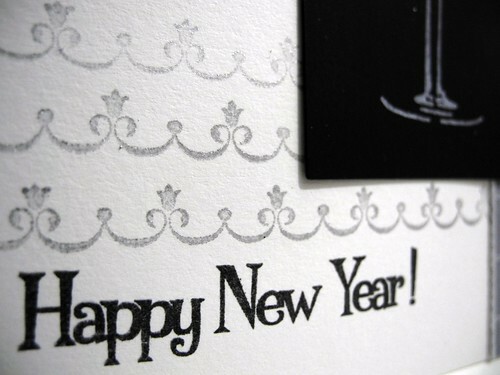 LOVE this very classy-yet-pretty card! Black and silver? Can't go wrong with that combo! I'm so glad your Christmas was good! Mine too! SO good, in fact, I believe I'll just have another Christmas about the same time NEXT year! LOL! Love you! Love this classy beauty Jingle!! The white on black and gray tones are so striking!! Gorgeous!!! What's on Your Workspace FLOOR Wednesday!!! Happy Christmas Eve and a fun Announcement!!! Skipping Stones Design Sketch Tuesday - Joy! Stampendous Saturday! - Color Challenge Week 3! Skipping Stones Design Feature Friday!!!! A Christmas Ornament for you, Deer! It's Stampendous Saturday! Color Challenge Time! Skipping Stones December with Canvas Corp. It's Stampous Saturday with a NEW Challenge! I Believe in a bit of CRAZINESS! Just say'n.